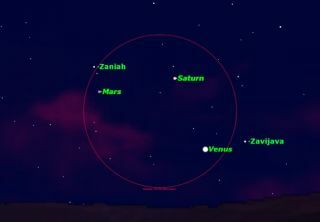 On the evening of Aug. 5, Venus, Mars and Saturn will gather in the western sky bracketed by the stars Zaniah and Zavijava in Virgo. All three planets will fit in a 10x50 binocular field, as shown by the circle. Atrio of planets converging in the night sky this week and for several nightswill give casual skywatchers the perfect chance toeasily see and identify worlds they might not normally notice. The event, building up to a super celestial snuggle in early August,is also a chance to watch and grasp orbital mechanics in action. Theancients believed planetaryalignments to be full of mystery portending dreadful events. Now we realizethat, because the planets all move in a common plane called the ecliptic, theyregularly line up with each other over time as seen from planet Earth. Theecliptic is the same path across the sky followed by the sun, and so the threeplanets will appear to be following the sun into the Western horizon asdarkness falls. Theecliptic corresponds to the plane in space that Earth and the other planetstravel in as the orbit the sun. Since the inner planets, like Venus, make theirannual orbits faster than the outer worlds, like Mars, they're constantlytrading places in our sky, converging and receding from one another as seenfrom our vantage point. Planetaryalignments are known to astronomers as conjunctions or appulses.The moon, which is also traveling close to the plane the planets orbit in, isin conjunction with each of the planets at some point every month. Conjunctionsbetween pairs of planets, particularly the faster moving inner planets, occurseveral times a year. Conjunctionsof three or more planets are much rarer. This one has been building for severalmonths, and will reach its culmination in the coming week. Lookin the western sky just after sunset any night this week. Your eyes willimmediately be drawn to the brilliantplanet Venus ? it's brighter than any night sky object except themoon. Lookmore closely as the sky gets darker, and you will see that Venus is accompaniedby two lesser lights. These are the planets Mars and Saturn. OnSaturday night, July 31, Mars will be just below Saturn, less than two degreesaway (your fist on an outstretched arm measures about 10 degrees of the sky).The following Saturday, Aug. 7, Venus will have moved westward so that it isless than three degrees below Saturn. Allthree planets are moving eastward (left to right for viewers in the NorthernHemisphere) against the background stars of the constellation Virgo. The solarsystem's inner planets move across our sky (and around the sun) in much lesstime much than the outer planets, and so they rapidly move past distant Saturn. OnThursday night, Aug. 5, the three planets will be closest together, forming atight triangle that will easily fit in the fieldof binoculars. Appearancesare deceptive. Although close together in the sky, the three planets areactually at very different distances from the Earth. Venusis closest at 0.796 astronomical units distance, Mars next at 2.022astronomical units, and Saturn a distant 10.191 astronomical units. Becausedistances to other planets are, well, astronomical if measured in miles orkilometers, astronomers usually measure them in astronomical units: anastronomical unit is the average distance between the Earth and the Sun, 93million miles or 150 million kilometers. Thisarticle was provided to SPACE.com by Starry Night Education, the leaderin space science curriculum solutions.